This kitchen is FANTASTIC! 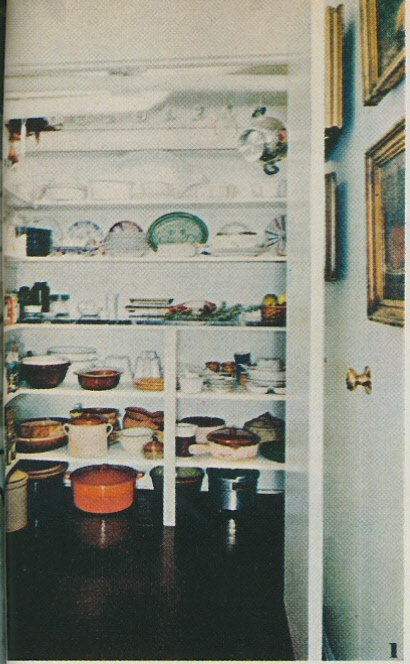 I long for the days of simpler kitchens. 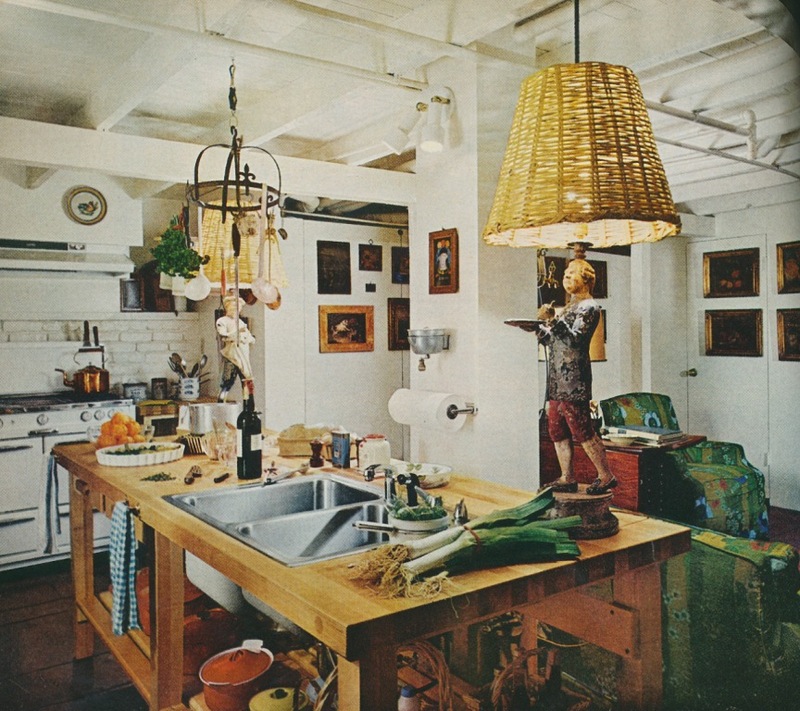 As a designer, I am all too often a bit disgusted by the overdone and frankly, tacky, kitchens that I come across. Mr. Williams' kitchen has everything anyone needs as a working kitchen (obviously since Williams-Sonoma was born here) yet is charming, simple, comfortable. Actually, this was a kitchen of later years for Chuck Williams. The business began in a small hardware store in the town of Sonoma and moved to San Francisco a few years later. Chuck actually had several homes before this, as he was a builder and renovator long before his kitchen business was founded, and lived in a small house behind the original location with his mother when he first opened Williams Sonoma. (The note below discussing the whitewashing of his friendship with Mike Sharp is, I believe, inaccurate. 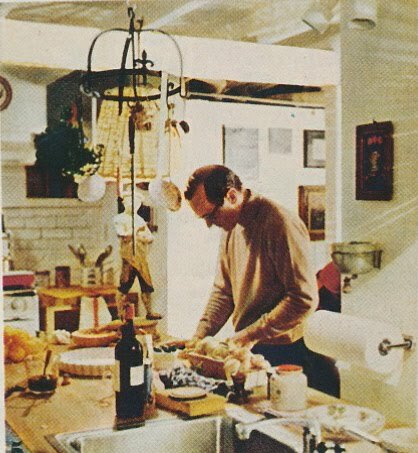 The book mentions him often, but the content of the book is more centered on Chuck and his company and those individuals that affected this part of his life, of which Mike is also included. It's a great read since Chuck was a man of many talents! I love this simple but elegant kitchen! Sounds like he applied the same simple elegance to his menu also. 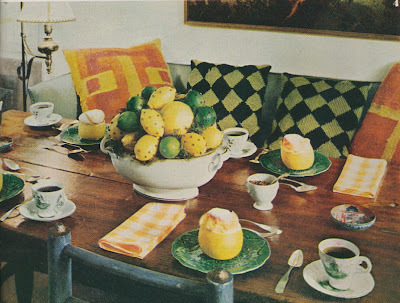 I am so stealing the clove studded lemons and limes-never thought of using them with anything but oranges. Thank you for the great post. His house manages to looks spacious and cluttered at the same time, which to me makes it rather inviting. One quibble: I find those clove-studded fruits rather frightening looking--they would be much more attractive just plain. 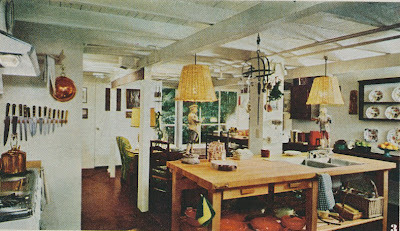 I agree that his kitchen is inviting; it's comfortable looking and quaint. 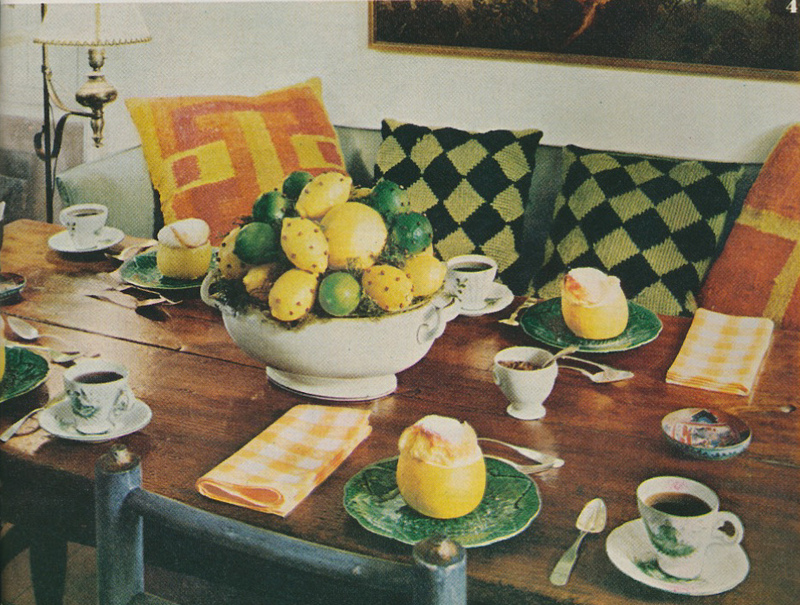 I admit that I never thought of studding lemons and limes before! There was another famous cook about the same time - Robert Carrier, an American who became famous in Britain during the 60s and 70s. Even had his own restaurant in an old country house which was one of the chicest places to go. I remember him more for his introduction of a pack of cards - each card had a photograph of the dish on one side and the recipe on the other. Blue, I'm slightly familiar with Carrier. The card idea is genius! Thank God for Chuck Williams' passion for cooking! I am obsessed with Williams-Sonoma. Thanks for this. We're currently rebuilding our kitchen (ripping out an 80's marble horror) and I really like this unfitted look, which we're trying to re-create as far as possible, with hanging racks, light oak and metro tiles. The Lutyens Scullery Look. As Blue says, Robert Carrier was incredibly famous in England during the 60s' and 70's (he was food editor for British Vogue, had a restaurant and cookery school in Islington, and a country house restaurant in Suffolk). He's almost completely forgotten now. There is hardly anything on youtube, although you can buy his old cookery books for a song. Might be worth having a look at- as they are full of technicolor kitchen photographs very similar to the one's you've posted above. "Food Wind & Friends" is a particular favourite. His food still looks good- even now- a bit retro, of course, but remarkably well photographed for the time. Years ago, as a very auction junior specialist, I had to telephone Robert Carrier to tell him that his camp 17th century carved wooden angels had failed to sell. He was utterly charming, shouted "Good, Good!" and told me he was thrilled to be getting them back! A real charmer. It's interesting to note that Mr. Williams' home is an "earthquake shack" put up quickly after the 1906 earthquake in San Francisco. 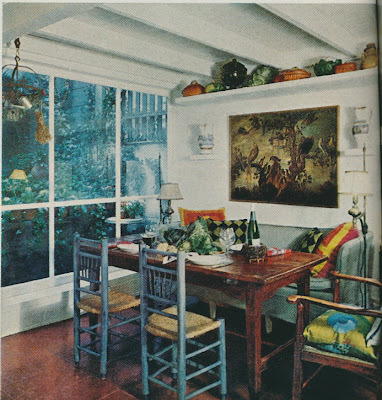 It was featured in a stellar May 1989 special issue of Architectural Digest. Thank you for letting me know. I never would have guessed it! I'm going to try to locate a copy of the issue of AD; I would love to see more of the house. It's sad to think about what a different time it was then, how Chuck Williams' life is whitewashed to remove his long-term partner, Mike Sharp (who lived with him in this house at the time), from the narrative. When Mike's health went into decline Chuck and Mike sold this home (on Garden Court in San Francisco) and moved into an apartment with an elevator and a door man on Russian Hill. Mike died soon thereafter. This is all documented (kind of cagily still) in Merchant of Sonoma: Chuck Williams, by William Warren, published by Weldon-Owen and available on Amazon.com. I can corroborate the comment from Anonymous. Mike Sharp was my godfather; he and my father met in the army during WWII and ran an antique shop together in San Francisco during the late 40's. My father visited Mike several times at the "earthquake" house. I believe Mike died around 1992--will have to get the book and see! It's a shame that Chuck Williams' personal life had to be whitewashed.